O Children, do you hear her cries in the echo of your own? O Children, Dear Children, for what will you fight? 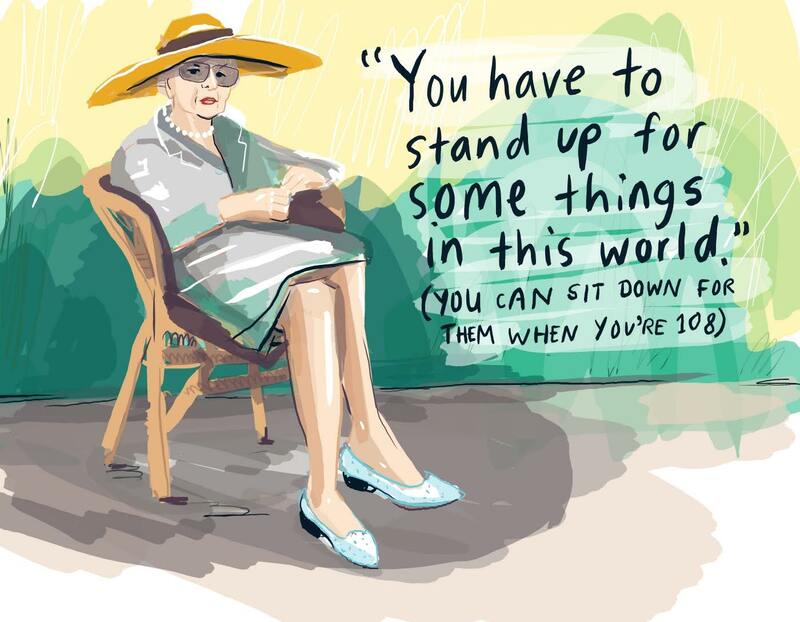 I am Marjory Stoneman Douglas and I’ll fight once more. A local newspaper in Miami asked Marjory to go down to the docks and complete an interview with the first woman in Florida to enlist in the Navy. The woman didn’t show up and the next thing you know, Marjory had her arm in the air swearing to serve and protect the United States of America. She was a yeoman first class but soon transferred to the Salvation Army and headed to France. She celebrated the end of the war in Paris. She continued her work with the Salvation Army and traveled throughout Italy, Yugoslavia, Serbia, and Albania. She later wrote about traveling over mountains on horseback and sailing with Italian soldiers while they took turns throwing up. Her mother suffered from mental illness and by the end of her short life, Marjory had assumed the role of the mother. Marjory also experienced three nervous breakdowns in her life. During these breakdowns, she said that it felt as if a shutter had been drawn down over her mind. The first Valentine’s Day Massacre happened in Marjory’s lifetime. It was ordered by Al Capone, from his residence in Miami. The slaughter occurred in Chicago while Capone was headed to a meeting at the Dade County Courthouse. The city of Miami, and Marjory herself, fought against their violence and presence in the city. There are only two or three human stories, and they go on repeating themselves as fiercely as if they had never happened before (Willa Cather). Words speak in metaphors and teach us through stories. Sometimes, they fill us with remembering and purpose. Better yet, the right words speak to our soul.